Do you remember Wii Sports? Sure you do. It’s everywhere. 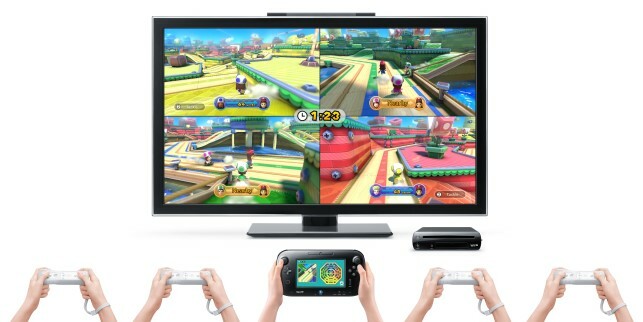 Even your aunt who doesn’t even play games has a Wii and Wii Sports. 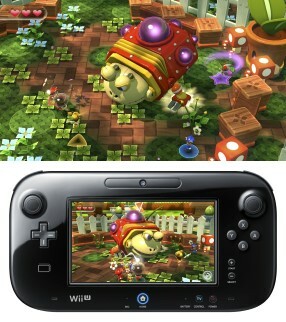 And despite Nintendo not packing Nintendo Land with every system, it’s probably going to be another one of those types of things. 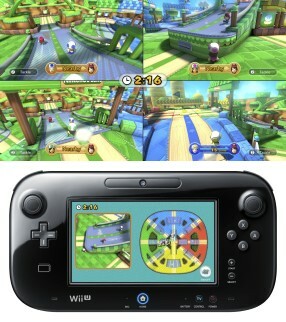 Nintendo Land is a collection of mini-games styled in a virtual theme park whose attractions are based on popular Nintendo IP. 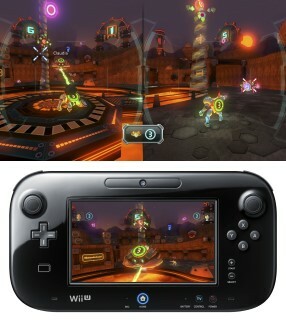 Going this route, Nintendo allows themselves the opportunity to showcase the new Wii U Gamepad without having to resort to shoehorning these features into games where they don’t make sense. 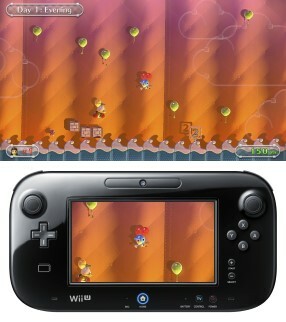 Games I personally had an opportunity to try out were Takamaru’s Ninja Castle and Donkey Kong’s Crash Course. 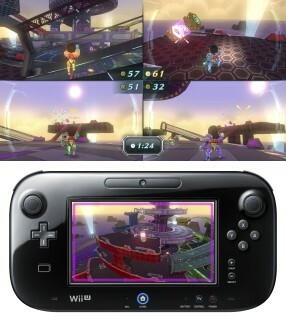 Each of these games leverage the controller itself as it’s main source of input. 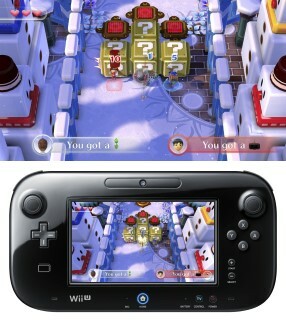 In Takamaru’s Ninja Castle, a game for all intents and purposes is Whack-a-Mole, players will instantly recognize the symbiosis between the Wii U Gamepad and the Wii U console itself. 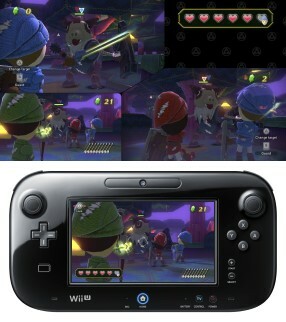 While you are using the touch screen on the Wii U gamepad to manipulate game elements, in this case shurikens, the major difference is that you are flinging the shurikens at the screen. 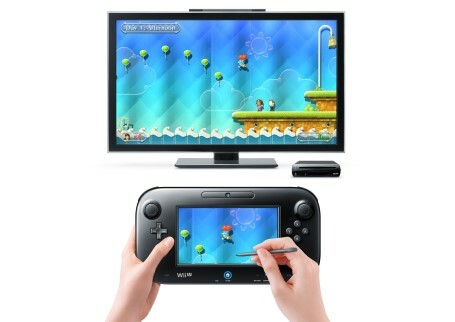 Depending on the angle that you hold the Wii U Gamepad determines it’s trajectory. I have to admit that it is kind of magical to swipe your finger along a path on a touch device you are holding and have that digital representation of a shuriken fly towards a target on your TV screen. 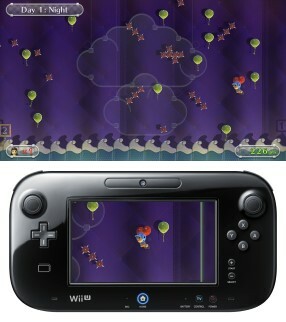 The other game I demoed was Donkey Kong’s Crash Course. 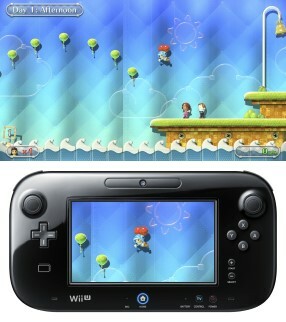 This is a game that you play exclusively on the Wii U Gamepad itself. The main focus of the game is using the gyroscope/accelerometer on the Wii U Gamepad to guide a trolley (the only reference I can think of to Donkey Kong) along a convoluted course vying for the best time whilst not damaging the trolley. Along your path, you’ll find levers and platforms that need to be raised/lowered in the correct sequence or timing via the left and right triggers. It’s a fun little diversion, but it honestly feels like any smartphone app. 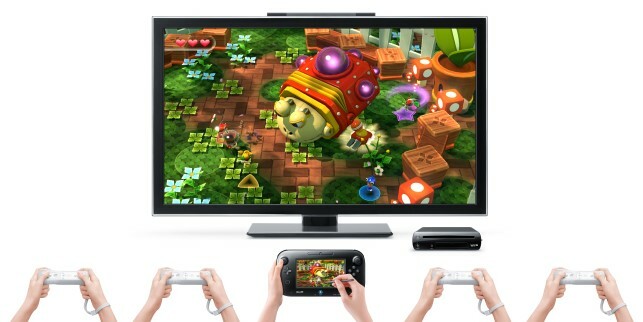 Other additions include interesting party games with a mix and match of controllers. 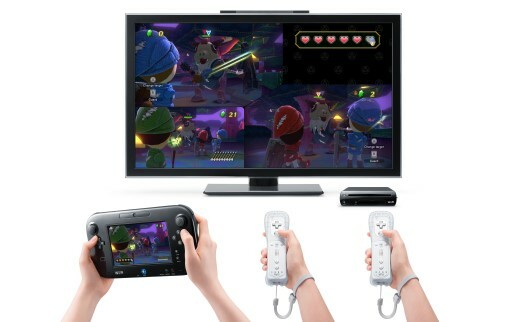 Looking at the images below you’ll get a quick idea on how unique game experiences can be played with one Wii U GamePad and multiple Wiimotes (And everyone should have plenty of wiimotes left around). 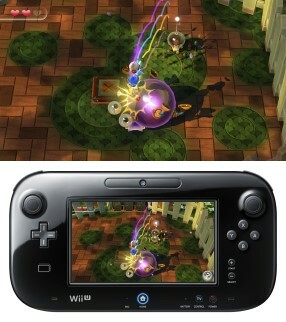 One such game is Luigi’s Ghost Mansion. One person using a Wii U Gamepad plays as the ghost of mansion and is completely hidden to all of the other players who are using Wiimotes and operating on the main TV screen. 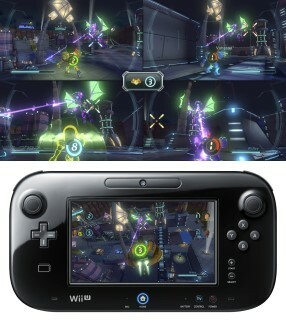 Luigi’s Mansion is a game that takes design cues from the physical game “Marco Polo’ where the Wiimote players need to traverse the maze-like mansion and be very conscious of the rumble that is happening on their controllers. The closer a player is to the ghost, the greater the intensity of the rumble. This is where the cooperation of the team has to come together to defeat the ghost player. 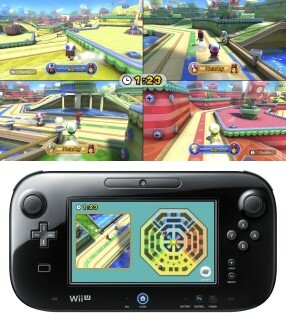 There are a total of twelve attractions, half competitive/cooperative the other half single player. 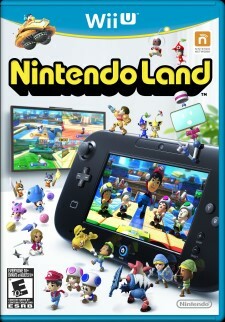 While I personally believe Nintendo Land is aimed at a more casual audience, it still has a lot to offer the seasoned gaming veteran who is looking to make use of the compliment of Wii U features. Nintendo Land’s biggest selling point for me is to act as a vessel to segue my son’s gaming habits from the iPad to a more traditional controller. Time will tell if that plan phases out. 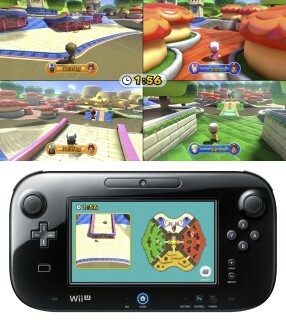 I’ll be scooping my Wii U Deluxe edition up come Nov 18th.